William Trotter, 37, of East Vines, Sunderland, who appeared at Newcastle Crown Court on February 4 to admit a charge of burglary at a Pizza Hut on St Luke's Terrace in Sunderland. Minutes later he returned to the premises on St Luke's Terrace and crawled back in, to make a poor attempt to mop up the evidence, before trying to wash it away with Pepsi he found in a fridge, splashing it over the floor. When interviewed by police, Trotter, of East Vines, Sunderland, admitted the offence but refused to watch the CCTV, claiming: "It's just a waste of time, get on with it." 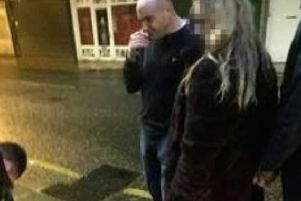 Detective Constable Stuart Havery, of Northumbria Police, said: "He broke into the business premises and made away with the till before attempting to wash away the evidence to make sure he was not punished for his actions. "Unsurprisingly, the extent of his crime could not be hidden by a splash of Pepsi - and he'll now face the consequences of his selfish actions."